The Newest Rant: Random Digital Comic Review--Cabra Cini: Voodoo Junkie Hitwoman. 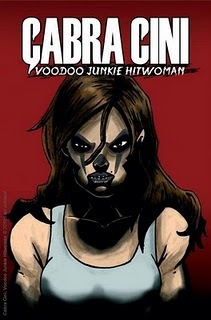 Random Digital Comic Review--Cabra Cini: Voodoo Junkie Hitwoman. Yeah, this was above-average. Its a bit melodramatic, but I find the crazy concepts of other-wordly monsters and the like interesting, and the art is good too. Putting aside what I've read about voodoo being misunderstood by popular media and actually being pretty harmless, I find the story's utilization of magic and whatnot interesting, with the fight scenes flowing well. I was a bit annoyed by the whole, "boyfriend-pimp who abused the heroine" angle, as I don't like when the main reason a character in a comic became a hero (or hitwoman, in this case) was because she achieved this self-actualization through a man. Sort of the whole, "I was raped and now I'm a hero etc. etc." spiel that is just stupid (remember that Kevin Smith Black Cat storyline with this concept, anyone?). I'll let it slide here though because lots of characters have origins that rely on being beaten up or abused/traumatized before achieving success and Cabra Cini also was drug addict so her character is defined by more than an abusive boyfriend. It just gets old when its the cliche female-gets-tough-to-fight-the-mean-male concept. As if a woman can't be proactive without some past abuse. Other than my little rant above, I enjoyed the comic and wouldn't mind following future adventures of our heroine. If you want to spend some free time reading free comics, you can go to samjohnson-comics.blogspot.com and check it out.